Let's Learn English with Teacher Wani: What is English Language? English is actually an Anglo-Saxon language. Words in the English language are mostly borrowed from Latin, Greek and if you've noticed, some Malay words are now adopted in the Oxford Dictionary. 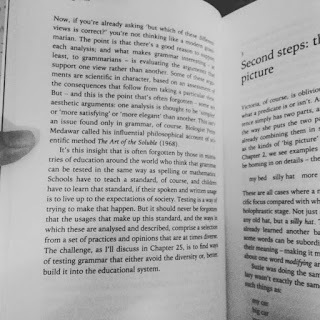 Recently, I acquired the book Making Sense by David Crystal. It described the English Language in story-like passages that won't leave you bored. The author also describes how children develop their language and also how children acquire languages. Turns out: it's from infancy stage!